Background: To compare two methods of weaning premature infants from nasal continuous positive airway pressure (NCPAP). Methods: Between March and November 2012, 88 preterm infants who were stable on NCPAP of 5 cmH 2 O with FIO 2 <30% for a minimum of 6 h were randomly allocated to one of two groups. 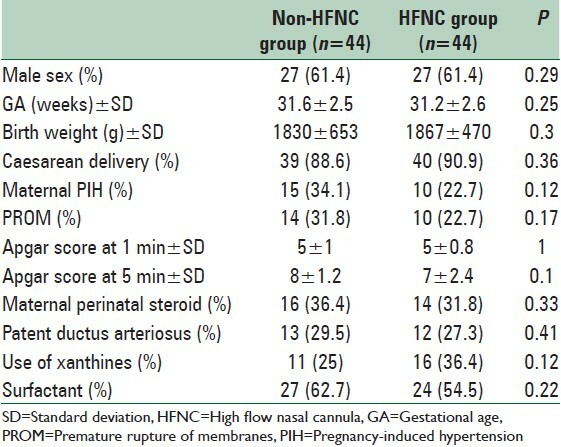 The high flow nasal cannula (HFNC) group received HFNC with flow of 2 L/min and FIO 2 = 0.3 and then stepwise reduction of FIO 2 and then flow. The non-HFNC group was maintained on NCPAP of 5 cmH 2 O and gradual reduction of oxygen until they were on FIO 2 = 0.21 for 6 h, and we had weaned them directly from NCPAP (with pressure of 5 cmH 2 O) to room air. Results: No significant differences were found between 2 study groups with regards to gestational age, birth weight, Apgar score at 1 and 5 min after birth, patent ductus arteriosus and use of xanthines. 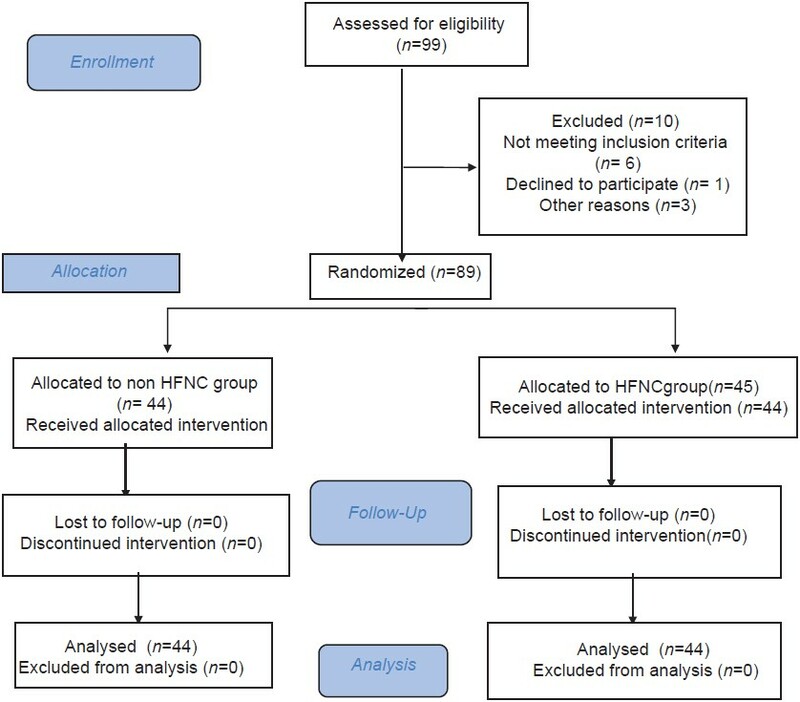 The mean duration of oxygen therapy after randomization was significantly lower in HFNC group compared to non-HFNC group (20.6 ± 16.8 h vs. 49.6 ± 25.3 h, P < 0.001). Also, the mean length of hospital stay was significantly lower in HFNC group compared to non-HFNC group (11.3 ± 7.8 days vs. 14.8 ± 8.6 days, P = 0.04). The rate of successful weaning was not statistically different between two groups. Conclusions: Weaning from NCPAP to HFNC could decrease the duration of oxygen therapy and length of hospitalization in preterm infants. The high incidence of pulmonary complications of mechanical ventilation has led to a tendency to use alternative methods of respiratory support in preterm infants. Nasal continuous positive airway pressure (NCPAP) is a noninvasive method that provides a constant positive pressure to the airways of spontaneously breathing infants. This constant pressure improves oxygenation by increasing functional residual capacity and recruitment of collapsed alveoli. In addition, NCPAP promotes redistribution of lung fluid and reduces upper airway resistance. As a result, it is a useful and relatively safe method for treatment of respiratory problems especially in preterm infants. Despite many documented benefits of NCPAP, it is a form of respiratory support that has its complications including traumatic injuries to the nose, pulmonary air leak syndromes and gaseous distension of the stomach. [8, 9, 10] Therefore, reducing the duration of NCPAP application could decrease the associated complications. However, premature discontinuation of NCPAP has potential hazards including increased apnea, oxygen demand and the need to restart NCPAP, and occasionally mechanical ventilation. The humidified HFNC system has been adopted as a primary support for respiratory distress syndrome,  for treating apnea of prematurity and to support premature neonates after extubation as an alternative to NCPAP. However, its efficacy for earlier weaning from NCPAP has not been well studied. The objective of this study was to examine whether the use of HFNC with earlier discontinuation of NCPAP could decrease the duration of oxygen therapy and length of hospital stay in premature infants. Between March and November 2012, we conducted a randomized controlled trial at the neonatal Intensive Care Unit (NICU) of Al-Zahra University Hospital, affiliated to Isfahan University of Medical Sciences, Isfahan, Iran. Inborn infants with gestational ages of 28-36 weeks who were met the following criteria were enrolled into the study: Receiving NCPAP at a pressure of 5 cmH 2 O with FIO 2 requirement of 30% to maintain an oxygen saturation of 88-95%, the lack of apnea (pauses of respiration for more than 20 s associated with bradycardia or cyanosis with more than 2 episodes in 12 h or more than 3 episodes in 24 h with at least one which needed bag and mask ventilation)  or signs of respiratory distress including tachypnea, moderate or severe intercostal or subcostal retraction and nasal flaring under these NCPAP setting. Exclusion criteria were major congenital malformation, grade 3 or 4 intraventricular hemorrhage, neuromuscular disorders, pulmonary hypoplasia, cleft lip and palate, chest wall deformity, cyanotic congenital heart disease. The study protocol was approved by the Ethics Committee of Isfahan University of Medical Sciences. Parents of eligible newborns were approached for participation in the study, and informed consent was obtained from them. We have been used a uniform protocol for the management of respiratory distress syndrome in our NICU. Concisely, all newborns with spontaneous respiration that have signs of respiratory distress are placed on NCPAP with 5-6 cmH 2 O. The continuous positive airway pressure (CPAP) pressure could increase up to 8 cmH 2 O if respiratory distress is not alleviated. NCPAP failure is defined as increased work of breathing characterized by ongoing tachypnea (respiratory rate of more than 60 per min for more than 2 h), significant retraction, apnea as explained above, abnormal blood gases (2 samples with an interval of more than 2 h) with low pH of <7.2, PCO 2 of more than 65 mmHg and PaO 2 of <50 mmHg with FIO 2 of >60%). Once the newborns remained stable for 6 h, we initiated NCPAP weaning. FIO 2 was lowered gradually down to 30%, then NCPAP pressure was reduced down to 5 cmH 2 O. 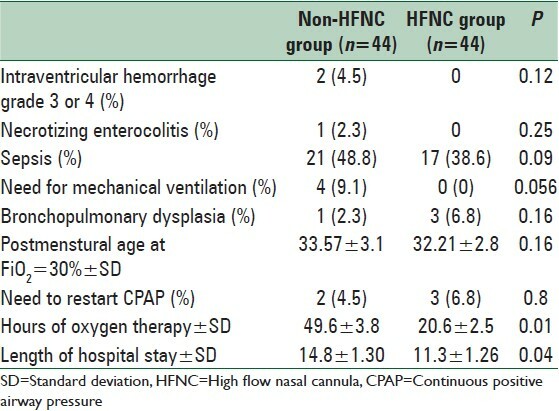 The HFNC group was given HFNC with flow of 2 L/min and FIO 2 = 0.3 after discontinuation from NCPAP. FIO 2 were adjusted to maintain oxygen saturation between 88 and 95%. HFNC flow was kept at 2 L/min until FIO 2 requirements were 0.21. After that, we had lowered HFNC flow 0.5 L/min every 1 h until a flow of 0.5 L/min achieved. At this time, the infants were separated from HFNC. In the non-HFNC group the newborns were maintained on NCPAP and FIO 2 gradually decreased to 0.21. Patients stable on this setting for 6 h were weaned directly from NCPAP (with pressure of 5 cmH 2 O) to room air. If their oxygen saturation has fallen below 88%, we have administered free flow oxygen by blender to achieve FIO 2 of 88-95. Successful weaning was defined as the absence of respiratory distress and no requirements of more than 0.21 for 72 h on room air. In the presence of any of the following conditions we applied NCPAP again in both groups: (1) The need for FIO 2 >60% to maintain oxygen saturation of more than 88%, (2) signs of respiratory distress including nasal flaring, retraction, tachypnea (respiratory rate of more than 70 for more than 1 h), (3) Apnea during first 48 h after discontinuation of NCPAP. We recorded oxygen saturation and heart rate on Masimo Pulse Oxymeter (Masimo CO, Irvin, California, USA) during the study. We were used Bubble CPAP System (Fisher and Pykel Healthcare, Auckland, New Zealand) and short binasal cannula for NCPAP administration. HFNC system included a gas source, air/O 2 blender and a humidifier rendering air/O 2 via short nasal cannula (Fisher and Pykel RT329, Salter Labs). We have started methylxanthines for treatment of apnea of prematurity on the basis of our NICU protocols. We have recorded newborn information including birth weight, gestational age, route of delivery, prenatal steroid use, prolonged rupture of membranes for more than 18 h before delivery, surfactant therapy. Presence of patent ductus arteriosus (PDA) and the need for methylxanthines. The main outcome was the duration of oxygen requirement. The secondary outcomes were duration of respiratory support, rate of successful weaning and duration of hospitalization. We calculated that a sample size of 41 infants in each group was needed to detect a difference of 30% for the duration of oxygen dependency with 80% power and significance of 0.05. Computer generated random numbers were used for randomization. Infants were randomized to one of two CPAP weaning groups from concealed envelopes opened by nonstudy personnel. The investigators in this trial were not blinded to study intervention. Data were analyzed with the use of SPSS software (version 20, SPSS Inc., Chicago, IL, USA). Differences between groups were evaluated by Fischer's exact test and Chi-square for each categorical variable and by Student's t-test for each continuous variable. A total of 109 preterm newborn with gestational ages of 28-36 weeks were recruited for the study. From these infants, 89 patients were enrolled in the trial and were randomized as shown in [Figure 1]. Of the 89 infants who enrolled the study, 88 newborns completed the study. We did not find any significant differences between 2 study groups with regards to gestational age, birth weight, route of delivery, Apgar score at 1 and 5 min after birth, PDA, use of xanthines, prolonged rupture of membranes and maternal pregnancy induced hypertension and prenatal steroid usage [Table 1]. 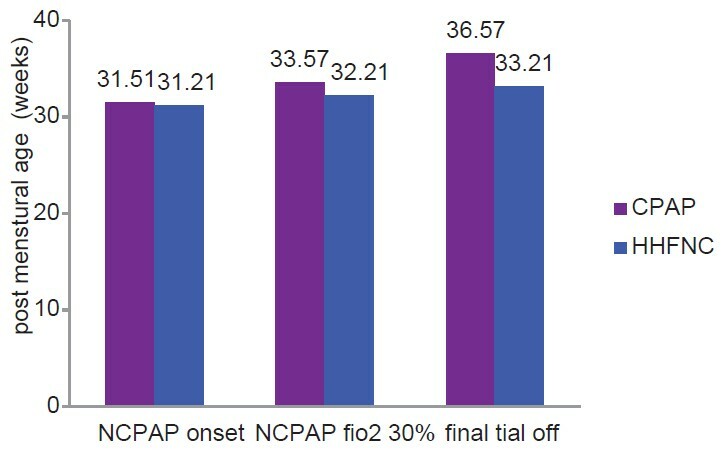 There was no significant difference in the number of infants who successfully trailed off NCPAP in the first attempt between the HFNC group (3 infants) and non-HFNC group (2 infants) (P = 0.8). The infants were successfully weaned off supplemental oxygen at postconceptional ages of 36.5 ± 2.1 weeks in non-HFNC group and 33.2 ± 1.9 weeks in HFNC group [Figure 2]. The postconceptional age when the newborns came from respiratory support (NCPAP or HFNC) was not significantly different between HFNC group (P = 0.8). The mean duration of oxygen therapy was significantly lower in HFNC group compared to non-HFNC group (20.6 ± 16.8 h vs. 49.6 ± 25.3 h, P < 0.001). Also, the mean length of hospital stay was significantly lower in HFNC group compared to non-HFNC group (11.3 ± 7.8 days vs. 14.8 ± 8.6 days, P = 0.04). Eleven infants (25%) in the non-HFNC group and 17 infants (38.6%) in the HFNC had significant apnea, (P = 0.12) and received methylxanthines. Four neonates (9.1%) in the nonHFNC group required mechanical ventilation because of respiratory failure, but no infant in HFNC group required mechanical ventilation (P = 0.05). Outcome indicators of both groups are represented in [Table 2]. We were trying to find a method for faster weaning from NCPAP in premature infants. Our study has shown an average of 12 h decrease in the duration of oxygen therapy and a 3.5 days decrease in the length of hospital stay in newborns weaned prematurely from NCPAP to HFNC. Although we did not use the graded time off method, we also found that gradual decreasing of NCPAP pressure to a predetermined level of pressure is a very useful method for weaning from NCPAP. Todd and Associates randomized 154 preterm newborns to one of the three methods of NCPAP weaning: Rapid discontinuation of NCPAP, graded time off without using nasal cannula and graded time off using nasal cannula. They found that infants in the first method group had significantly shorter duration of weaning period and length of hospital stay. Although we did not use a graded time off method, the rapid discontinuation of NCPAP in this study is very similar to non-HFNC method in our study. However, the mean duration of oxygen therapy using rapid discontinuation of NCPAP was about 24 days that is much longer than the figure of 2 days in our study of the non-HFNC group. This difference is probably due to lower gestational ages of newborns enrolled in Todd's study. Because more premature infants have lower lung compliance and a longer time is needed to reach normal lung compliance. In addition, bronchopulmonary dysplasia is more likely to develop in more premature infants. In contrast, our study revealed that the mean duration of oxygen therapy was significantly lower in HFNC group compared to non-HFNC group. Also, the mean length of hospital stay was significantly lower in HFNC group compared to non-HFNC group. These differences may be due to differences in methodology. The mean duration of oxygen therapy in non-HFNC group in our study was about 2 days compared to 5 days in that study. This difference could partially be due to shorter maintenance on NCPAP after initial stabilization in our study (6 h instead of 24 h). Moreover, they were kept flow rate at 2 L/min until the FIO 2 requirements were 0.21and then the HFNC flow was lowered step by step by 0.5 L/min every 6 h until a flow of 0.5 L/min was attained. We also did not lower flow rate until the FIO 2 requirements were 0.21 but, the HFNC flow was decreased gradually 0.5 L/min every 1 h until a flow of 0.5 L/min was attained. So it seems that using the most similar methods could yield more similar results. We found that the need for intubation and mechanical ventilation was higher in newborns who enrolled in the non-HFNC group but, this difference was not significant. We speculated that this difference may be due to higher number of infants suffered from severe intraventricular hemorrhage in non-HFNC group. We also found that successful weaning was not significantly different between two groups. To the best of our knowledge and belief, this study is the first on NCPAP weaning method that used such aggressive timetable and producing such promising results. However, our study had some limitations. First of all blinding of care providers was not possible because of the nature of the study using two different devices for respiratory support. Secondly, although we defined the success and failure of the weaning methods by clinical guidelines, it is likely that subjectivity of the care providers' decision could affect the final results. Weaning premature infants off NCPAP could successfully be done by HFNC or by decreasing FIO 2 to 21% after reaching NCPAP pressure of 5 cmH 2 O. HFNC can decrease the duration of oxygen therapy and length of hospital stay. The authors are grateful to all staff involved in this study for their assistance. They would also like to thank the Bureau for Research, Isfahan University of Medical Sciences, for funding the study. de Winter JP, de Vries MA, Zimmermann LJ. Clinical practice: Noninvasive respiratory support in newborns. Eur J Pediatr 2010;169:777-82. Morley CJ, Davis PG. Continuous positive airway pressure: Scientific and clinical rationale. Curr Opin Pediatr 2008;20:119-24. Hutchison AA, Bignall S. Non-invasive positive pressure ventilation in the preterm neonate: Reducing endotrauma and the incidence of bronchopulmonary dysplasia. Arch Dis Child Fetal Neonatal Ed 2008;93:F64-8. Polin RA, Sahni R. Newer experience with CPAP. Semin Neonatol 2002;7:379-89. Davis PG, Henderson-Smart DJ. Nasal continuous positive airways pressure immediately after extubation for preventing morbidity in preterm infants. Cochrane Database Syst Rev 2003;2:CD000143. Mathew OP. Apnea of prematurity: Pathogenesis and management strategies. J Perinatol 2011;31:302-10. Morley CJ, Davis PG, Doyle LW, Brion LP, Hascoet JM, Carlin JB, et al. Nasal CPAP or intubation at birth for very preterm infants. N Engl J Med 2008;358:700-8. Diblasi RM. Nasal continuous positive airway pressure (CPAP) for the respiratory care of the newborn infant. Respir Care 2009;54:1209-35. Thompson MA. Early nasal continuous positive airway pressure to minimize the need for endotracheal intubation and ventilation. Neoreviews 2005;6:e184-8. Jatana KR, Oplatek A, Stein M, Phillips G, Kang DR, Elmaraghy CA. Effects of nasal continuous positive airway pressure and cannula use in the neonatal intensive care unit setting. Arch Otolaryngol Head Neck Surg 2010;136:287-91. Singh SD, Bowe L, Clarke P, Glover K, Pasquill A, Robinson MJ, et al. Is decreasing pressure or increasing time off the better strategy in weaning VLBW infants from nasal CPAP. Eur J Pediatr Book Abstr Eur Acad Pediatr 2006;165:48. Soe A, Hodgkinson J, Jani B, Ducker DA. Nasal continuous positive airway pressure weaning in preterm infants. Eur J Paediatr Book Abstr Eur Acad Paediatr 2006;165:48-9. Finer NN, Bates R, Tomat P. Low flow oxygen delivery via nasal cannula to neonates. Pediatr Pulmonol 1996;21:48-51. Bouaram BA, Fernandes CJ. Heated, humidified high-flow nasal cannula therapy: Yet another way to deliver continuous positive airway pressure? Pediatrics 2008;122:218-9. Dani C, Pratesi S, Migliori C, Bertini G. High flow nasal cannula therapy as respiratory support in the preterm infant. Pediatr Pulmonol 2009;44:629-34. Manley BJ, Owen LS, Doyle LW, Andersen CC, Cartwright DW, Pritchard MA, et al. High-flow nasal cannulae in very preterm infants after extubation. N Engl J Med 2013;369:1425-33. Rastogi S, Rajasekhar H, Gupta A, Bhutada A, Rastogi D, Wung JT. Factors Affecting the Weaning from Nasal CPAP in Preterm Neonates. Int J Pediatr 2012;2012:416073. Todd DA, Wright A, Broom M, Chauhan M, Meskell S, Cameron C, et al. Methods of weaning preterm babies <30 weeks gestation off CPAP: A multicentre randomised controlled trial. Arch Dis Child Fetal Neonatal Ed 2012;97:F236-40. Abdel-Hady H, Shouman B, Aly H. Early weaning from CPAP to high flow nasal cannula in preterm infants is associated with prolonged oxygen requirement: A randomized controlled trial. Early Hum Dev 2011;87:205-8. Rastogi S, Wong W, Gupta A, Bhutada A, Deepa Rastogi, Maimonides Neonatal Group. Gradual versus sudden weaning from nasal CPAP in preterm infants: A pilot randomized controlled trial. Respir Care 2013;58:511-6.